Preterm birth is any birth that occurs before the 37th week of pregnancy. Currently, it is estimated that nearly 10% of births worldwide are preterm around 12% of births in the United States are preterm. Preterm birth can cause health complications, especially in very early arrivals like little one who arrive between 22 and 32 weeks gestation. Complications that can occur in an infant born this early include cerebral palsy, cognitive impairments, mild motor deficiencies and social or emotional issues. Infants born this early are often admitted to NICU (neonatal intensive care unit) for specialized care. Here, they are given time to allow their internal organs to finish developing. During this time, however, the infants can experience a great deal of stress. Stressors can range from intubation and testing to diaper changes. And while most NICUs try to only handle the baby once every 4 hours other factors such as apnea episodes, low levels and unforseen illnesses force them to have to ‘work on’ the baby more often. Studies have indicated that these stressors can be harmful to preterm infants but it was unclear if or how brain development is affected. Drs. Terrie Inder and Gillian Smith, Washington University researchers at St. Louis Children’s Hospital in Missouri are the first to report on what kind of effects early stressors might have on the brain development of preterm infants. 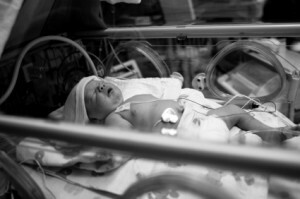 During the small study researchers observed 44 preterm infants within the first 24 hours of birth. All infants evaluated were born before 30 weeks gestation. To measure the stress of the infants, a measurement system known as the Neonatal Infant Stressor Scale was used. It consists of 36 different interventions that contribute to stress. Cerebral function and structure were evaluated through magnetic resonance imaging (MRI). According to the study results, average daily exposure to external stimulus was highest during the first 14 days of life. This higher level of stress was associated with decreased parietal and frontal brain width. Altered brain microstructure and functional connectivity in the temporal lobes were also noted. Reflex scores and abnormal movement patterns were also noted. According to the authors, more research is needed on the stress exposure and brain development in preterm infants to help improve their overall outcome.